In this paper, we report on the development of a methodology for stochastic parameterization of convective transport by shallow cumulus convection in weather and climate models. We construct a parameterization based on Large-Eddy Simulation (LES) data. These simulations resolve the turbulent fluxes of heat and moisture and are based on a typical case of non-precipitating shallow cumulus convection above sea in the trade-wind region. Using clustering, we determine a finite number of turbulent flux pairs for heat and moisture that are representative for the pairs of flux profiles observed in these simulations. In the stochastic parameterization scheme proposed here, the convection scheme jumps randomly between these pre-computed pairs of turbulent flux profiles. The transition probabilities are estimated from the LES data, and they are conditioned on the resolved-scale state in the model column. Hence, the stochastic parameterization is formulated as a data-inferred conditional Markov chain (CMC), where each state of the Markov chain corresponds to a pair of turbulent heat and moisture fluxes. The CMC parameterization is designed to emulate, in a statistical sense, the convective behaviour observed in the LES data. The CMC is tested in single-column model (SCM) experiments. The SCM is able to reproduce the ensemble spread of the temperature and humidity that was observed in the LES data. Furthermore, there is a good similarity between time series of the fractions of the discretized fluxes produced by SCM and observed in LES. Dorrestijn, J, Crommelin, D.T, Siebesma, A.P, & Jonker, H.J.J. (2012). 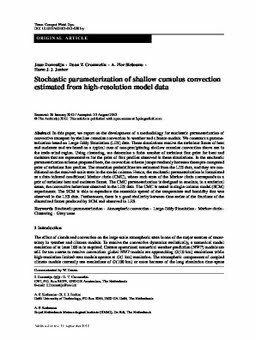 Stochastic parameterization of shallow cumulus convection estimated from high-resolution data. Theoretical and Computational Fluid Dynamics.